Approach your work with humility and innocence. That’s when it will become a work of art! There’s great wisdom in what Akhtar has said. Think about it. No one really wakes up to do a bad job. Yet works of art are rare – in whatever field you choose to consider. Besides, very few artists, professionals, sportspeople or other achievers, are able to sustain their success and stay on top of their game. The reason for this is that they are weighed down by their own success. They feel they have to prove something every time they work or play or create. It is only those who, as Akhtar explained, approach their work with humility, innocence and curiosity, who end up repeating their success or excelling in whatever they do – consistently. Another all-time great, Amitabh Bachchan often confesses to being nervous every time he faces the camera. Imagine, a legend like him feeling so! But that perhaps is the secret of his brilliance and of his ability to stay relevant in a highly competitive industry for over 40 years now! 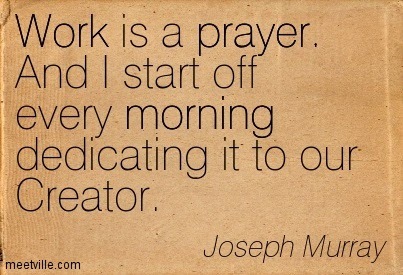 I see my work as a prayer. I feel when I work – write, deliver Talks, coach people, consult, lead Workshops – the Universe’s energy is expressing itself through me. I offer my being as a prayer, whenever I work, and I allow this energy to speak through me. None of what I do, or what anyone does, is an individual effort. Life expresses itself through each of us. And since there are so many of us – the expressions are myriad too. So, whether you are a housekeeper or a music composer, if you bow humbly to Life and offer yourself as an instrument for Life to express itself, whatever you do will turn out brilliant!